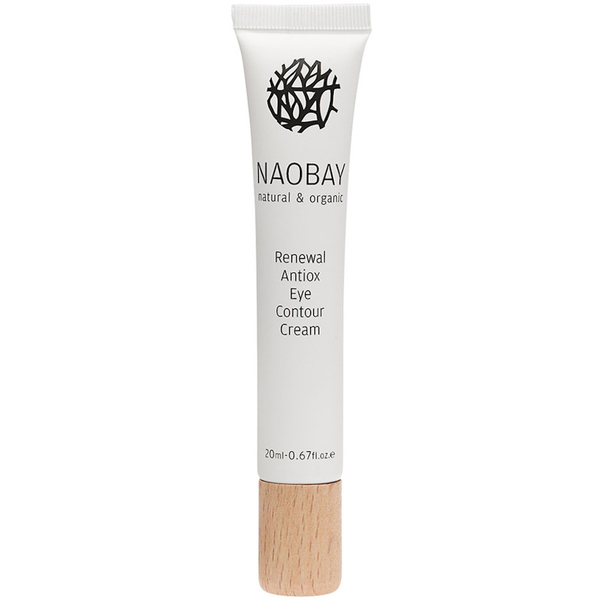 Rejuvenate the delicate eye area with Antiox Eye Contour Cream from NAOBAY (Natural And Organic Beauty And You). Enriched with a high concentration of Violet Extract, Gotu Kola and Aloe Vera, the fast-absorbing, fragrance-free formula works to combat fine lines, dark circles and signs of fatigue. Fortified with the Resveratrol molecule (a powerful antioxidant), the high performance, anti-ageing formula protects from daily environmental aggressors, whilst softening the look of lines and eliminating puffiness to reveal a smoother, more refined eye contour. Stimulates micro-circulation to leave eyes revitalised, restored and younger-looking. 98.89% of the total ingredients are of natural origin. Apply a small amount around the eye area. Avoid direct contact with eyes. Aqua, Decyl Cocoate, Glycerin, Caprylic/Capric Triglyceride, Argania Spinosa Kernel Oil*, Methyl Glucose Sesquistearate, Glyceryl Stearate, Stearyl Alcohol, Butyrospermum Parkii Butter*, Propanediol, Sesamum Indicum Seed Oil*, Rosa Moschata Oil*, Cinnamomum Zeylanicum Bark Extract*, Chamomilla Recutita Flower Extract*, Centella Asiatica Extract*, Pichia/Resveratrol Ferment Extract, Benzyl Alcohol, Potassium Sorbate, Sodium Benzoate, Dehydroacetic Acid, Citric Acid.